Once again the West Hill - Highland Creek Lions Club hosted its annual Craft Sale & Children's Fun Fair at the Heron Park Community Centre. This annual event is held in partnership with the Toronto Parks & Recreation Dept., East District. In addition to some 40 vendors, there was face painting and activities for the kids. And Santa put in an appearance while his elves handed out toys and candy canes to the children. President Melanie Goldhar presents a cheque for $1,000 to the Executive Director of the Boys & Girls Club of East Scarborough. The money will help them maintain and enhance their programs for youth at risk. The West Hill - Highland Creek Lions Club contribute awards to graduating students at each of the area's three local high schools. 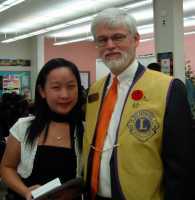 Tonight one young student from West Hill CI received an award of $300 from the Lions Club. The West Hill - Highland Creek Lions Club contribute awards to graduating students at each of the area's three local high schools. Tonight two students from Sir Oliver Mowat CI received awards totalling $300 from the Lions Club. The West Hill - Highland Creek Lions Club run a Bingo Night for the CNIB three times a year. Tonight's event was back in the usual room at at the CNIB Building (1929 Bayview Avenue, Toronto). Bingo nights are just one of the many ways Lions are involved with the CNIB. The West Hill - Highland Creek Lions Club run a Bingo Night for the CNIB three times a year. 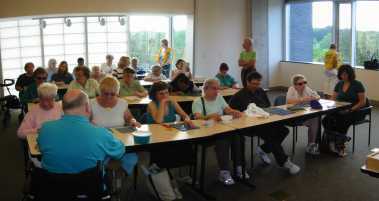 This event was held in smaller room at the CNIB Building (1929 Bayview Avenue, Toronto). Bingo nights are just one of the many ways Lions are involved with the CNIB. 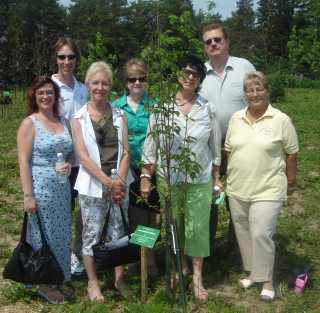 The West Hill - Highland Creek Lions Club sponsored a tree in memory of Lion Jim Scarnati, who passed away last year, at the Lions Foundation Memorial Forest in Breslau, Ontario. The club also donated towards the purchase of a new tractor to help maintaing the forest. Members of the West Hill - Highland Creek Lions Club once again hosted the children's area for the Highland Creek Heritage Day festival. Earlier in the day, they also participated in the parade. Highland Creek Heritage Day was started by the West Hill - Highland Creek Lions but it was taken over by a committee of local businesses and community organisations (including the Lions) several years ago. 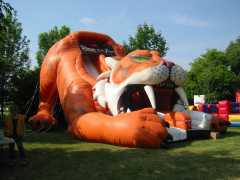 Shown is one of the popular inflatable rides, this year supplied by Redline Promotions. Members of the West Hill - Highland Creek Lions Club braved the rain to staff the BBQs at Loughlean Tire & Automotive Centre's 20th Anniversary Celebration. Through the generosity and community spirit of owner Gary Loughlean who also provided the food, and matching funds from Bridgestone, the event raised $1,000 which will go directly to community youth programs. Thanks also go out to the Thornhill Lions Club for providing the BBQ. Several members of the West Hill - Highland Creek Lions Club attended the opening of the new libary adjacent to the Heron Park Community Centre. The Library was built on land originally donated to the city by the West Hill - Highland Creek Lions Club and will feature a plaque commemorating the Lions Club's contribution. Councillor Gay Cowbourne said this about the Lions Club: "Some of you may or may not know that in 1950 the West Hill - Highland Creek Lions Club donated a parcel of land to what was then the Township of Scarborough. That parcel of land is where the Heron Park community centre was built and where this library now sits, so I want to take this opportunity today, to once again thank the Lions Club for their generous donation of the land all of those years ago. There is a beautiful plaque presently being made which will be a permanent feature in the entranceway, but unfortunately, it wasn't quite ready to have it on the wall today. As soon as it is received it will over there, visible as you come into the building, and it will proudly acknowledge and recognize the initial gift of land and the ongoing dedication and service that the Lions Club gives to this community." The West Hill - Highland Creek Lions Club presented a cheque for $300 to Michele Hull to support Pee Wee Baseball in West Hill. Go Goldenhawks! The West Hill - Highland Creek Lions Club hosted its annual Spring Creaft Sale at the Heron Park Community Centre. Featuring dozens of vendors, the sale attracted a large number of shoppers. The West Hill - Highland Creek Lions Club presented a cheque for more than $2,000 to the Emily Stowe Shelter. The cheque represented the money raised at a fashion show hosted by the Lions Club featuring fashions by Felicia's Fashions and prizes donated by many local businesses.